Penn State alumnus Joseph Firrantello inspects the ductwork, pipes and controls of a building’s HVAC system. UNIVERSITY PARK, Pa. — Researchers at Penn State are investigating the use of ultraviolet germicidal irradiation (UVGI) as a long-term maintenance solution for cooling coils in heating, ventilation and air conditioning (HVAC) systems in buildings. The research, conducted by William Bahnfleth, professor of architectural engineering, and alumnus Joseph Firrantello ('07 B.A.E., '07 M.S., '16 Ph.D.), is a field study that involved the installation of sensors to collect temperature, humidity, air flow and pressure drop data on HVAC cooling coils before and after UVGI was used to clean away the buildup of microorganisms. The project uses the data collected from the field research to create models that estimate the potential energy and indoor air quality (IAQ) benefits of UVGI cleaning. 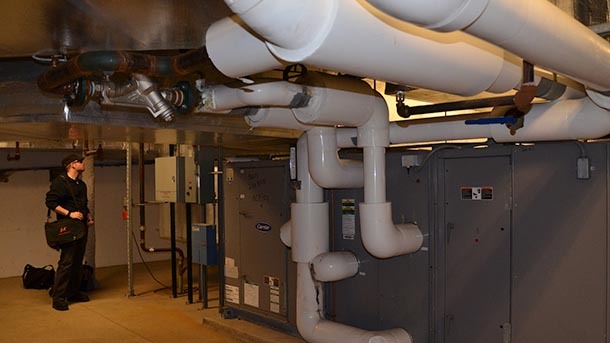 During normal operation, heat transfer coils in HVAC systems become polluted with microorganisms — primarily fungi and bacteria and other particulate matter in the air. This buildup leads to a loss of performance, both in lost heat transfer capacity and through the increased energy consumption that is needed to continue to move air through the system. Heat transfer coils are particularly vulnerable to contamination because of the condensation that forms on them and the fins that make up the system. Ultraviolet irradiation in the UVC band is an alternative or adjunct to mechanical and chemical cleaning options. Bahnfleth said UVGI systems are currently available from many manufacturers, but due to the lack of independent research and analysis to document the effectiveness of UVGI coil cleaning, their use is limited. In addition to calculating potential energy saving capabilities and IAQ benefits, the project also includes the continued monitoring of the research sites — HVAC systems located in two buildings. Sustaining these experiment sites allows for the collection of additional results, potentially leading to better application of the UVGI cleaning technology. “The ASHRAE Research Strategic Plan represents the current priorities of the built environment industry to solve the most pressing problems related to providing a high level of indoor environmental quality while minimizing impacts on the environment,” Bahnfleth said. This research aims to provide the architectural engineering and building communities with a comprehensive analysis of the energy benefits of using UVGI to decrease the microorganism buildup on cooling coils, as well as an approach to use these results in a design application. Experimentally verified models have been developed to implement into practical design tools. The field measurements have provided real-world data on the improvements to system performance due to UVGI cleaning and information on the method used to measure these improvements. Data is being applied in a range of building energy models to measure potential energy and IAQ improvements. 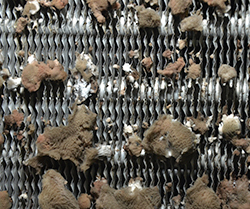 A buildup of microorganisms, such as fungi and bacteria, on HVAC heat transfer coils leads to lost system performance and decreased indoor air quality.